The latest episode of Star Wars Rebels season two is a perfect example of how, as good a show as this is, it’s not great at maintaining momentum. After last week’s game-changer of an episode, that storyline was put on pause for a tangent that didn’t feel wholly motivated. Brothers of the Broken Horn started with Ezra a bit on the grumpy side. He doesn’t want to train as a soldier, he doesn’t want to train as a Jedi and, as an audience member, I wasn’t quite sure why he was feeling that way. Is it because he’s scared of the Inquisitors on his tail? It didn’t seem like that. Is he just overworked and stressed out? Maybe, but we haven’t really seen that either. It just felt like an odd, almost unmotivated character place to start from and to drive an episode. Nevertheless, a distress signal from a familiar vessel gave Ezra an opening to get away from all of his responsibilities, and off he went. Though Ezra thought he was going to see crime boss Vizago, instead he ran into Hondo Ohnaka, a space pirate who played a decent sized role in The Clone Wars. He’s new to Rebels, but not Star Wars in general, and is just the latest Clone Wars exclusive character (Ahsoka Tano, Captain Rex, etc.) to pop up in the show. Hondo immediately takes to Ezra, mostly because Ezra lies and says his name is Lando Calrissian, a name Hondo is quite familiar with. Choosing that fake name ends up being fortuitous as Ezra shoots off with Hondo and runs into Azmorigan, yet another smugger who Ezra last met in the company of Calrissian. Azmorigan captures Hondo and Ezra, calls Ezra on his lie, and tries to kill them before Chopper comes in and saves the day with guns a-blazing. Yes, we now know that astromech droids can be good with a gun. In the end, Ezra ends up helping the Rebel Alliance by taking some of Hondo’s stolen cargo. In terms of action and character, Brothers of the Broken Horn was fun. But in terms of bigger stakes in the larger Star Wars Rebels universe, time will tell if Ezra’s uneasy alliance with Hondo will pay off. Hondo did say his best friend used to be a Jedi. He’s almost certainly referring to Obi-Wan Kenobi, who he had many dealings with - both good and bad - during the Clone Wars. And we know Kenobi is still out there. Ezra also mentioned maybe he should become a pirate, because Inquisitors don’t hunt pirates do they? Still, Ezra proved that even without the crew of the Ghost, he’s becoming a force to be reckoned with. He even used The Force properly in a few instances without Kanan to guide him. 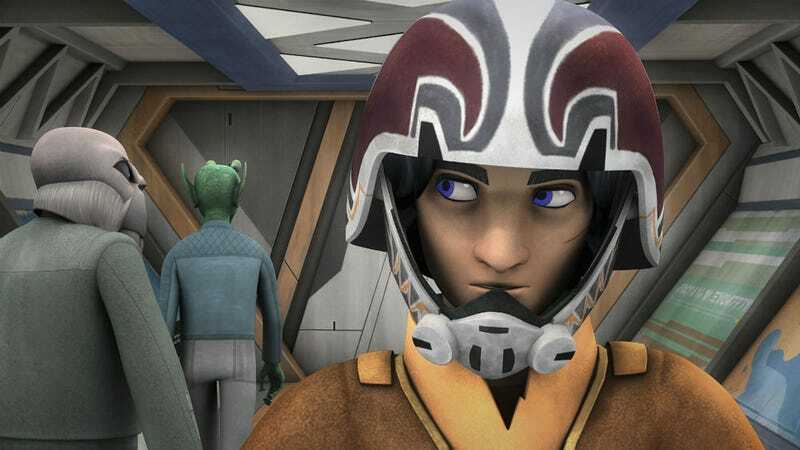 Those character building moments helped Ezra to realize that, despite his new stresses and responsibilities, he much prefers to be with a crew like on the Ghost than with a pirate like Hondo. No, we never quite understand why he felt like that in the first place, but he did grow as a character. That made for a fun, albeit a slightly stagnant, episode.